STAUNTON, Virginia,June 20, 2018 - It promises to be a long, hot summer, so Federated has kicked off an ultra-cool T-Shirt Tuesdays contest on Facebook where 50 lucky winners will receive a limited-edition Federated “The Best Memories” t-shirt. 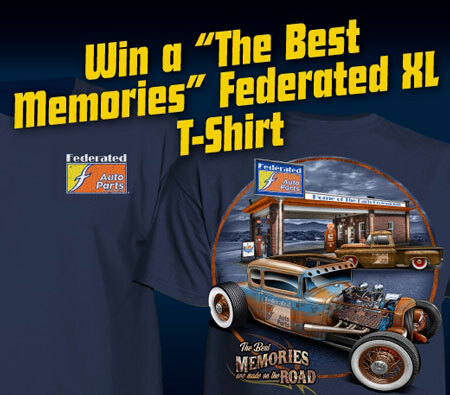 Each Tuesday from June 26 through August 28, Federated will announce five randomly selected winners of a free Federated “Best of Memories” XL t-shirt on its Federated Auto Parts and Federated Car Care Facebook pages. To be eligible, visit Federated on the Facebook desktop website from a PC or web browser on a mobile device and click on the T-Shirt Tuesdays contest tab on the left to enter. Each entry is valid for the duration of the contest. Entries are limited to one per email address on each page, however entrants can get extra chances to win by sharing the contest with their friends.